With the ever-expanding influence of the internet in the human capital world, employers must realise and understand the importance of employer branding to attract high value talent. Read more on this subject below. Employer Brand and Charity: What can this do for your company? We sat down with Sarah Roe, Director of Global Career Company and Chairman of Friends of Education Africa UK, to discuss the relationship between company and charity and the positive impacts on both your Employer Brand and your Employee Engagement. It might be a simple suggestion: “Employers must take care of their company brand.” Yet in a world increasing dominated by brand awareness and publicity, the question surrounding employer brand is becoming more and more vital. Do we remember what we are trying to do? With a quick look at differentiation and communication, we ask whether we have lost our way with employer value propositions in Africa. 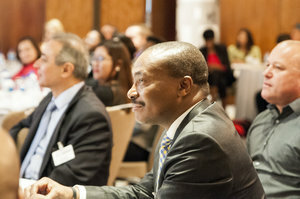 Subscribe to discover more articles on African human capital. For more information about the Talent Agenda Series West Africa or to register for the conference, please click on the link below.